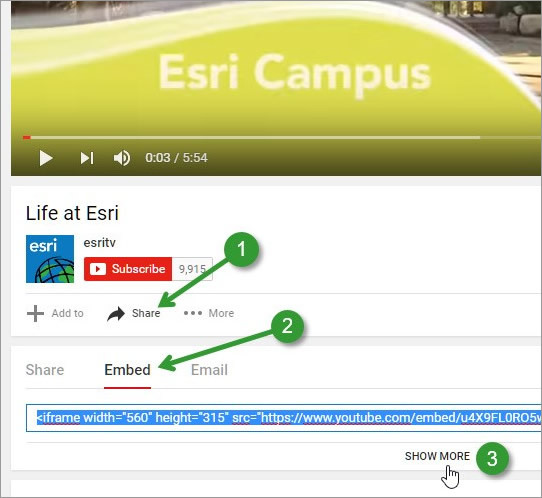 It's easy to add YouTube videos to your Esri Story Maps. But if you want more control over the various YouTube player options, such as autoplay, looping, and starting the video at a specific time, you can use player parameters. 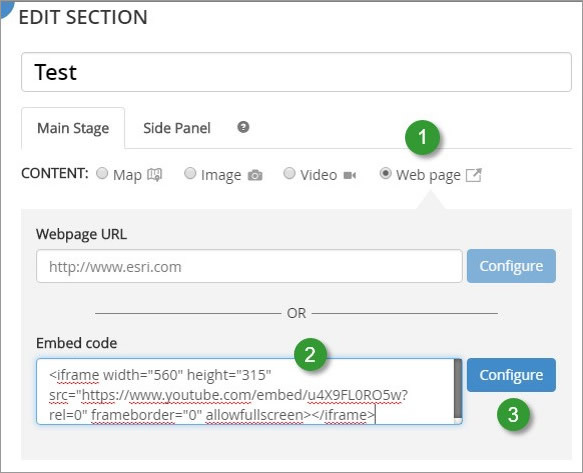 The Life at Esri YouTube video was used to illustrate this tip. To use YouTube player parameters, add the video using the video embed code instead of the standard methods described in the posts above. There are two ways to obtain the YouTube embed code: use the player embed options or start from scratch with your own code and modify it to suit your needs. Step 1. Open the YouTube video you want to use, and click Share. Step 3. Click SHOW MORE. The embed code is displayed along with options that you can toggle off or on. Step 4. Toggle the options, as desired. Step 5. Copy the embed code to paste into your story map. Below, the Show suggested videos when the video finishes check box was unchecked. This omits a display of related videos after your chosen video has finished. Note that the parameter rel=0 is what toggles related videos off. Changing the value to 1 (the default if the parameter is omitted) will toggle related videos on. View a story map example using the code above. Replace enter_video_ID with the ID of the video you want to use. Step 2. Paste the code in the Embed code input box. Step 3. Click Configure to choose a Position where the video will display. A good Position choice for video is Fit. Note that the video dimensions are ignored when using Fit; the video will be sized automatically to fit the dimensions of the Main Stage. Not all YouTube player parameters are displayed and available from the Embed options panel. Additional parameters can be found documented at the YouTube Embedded Players and Player Parameters reference. To add other parameters, check the reference for the appropriate values, then add them using &, the character reference for an ampersand ("&"). 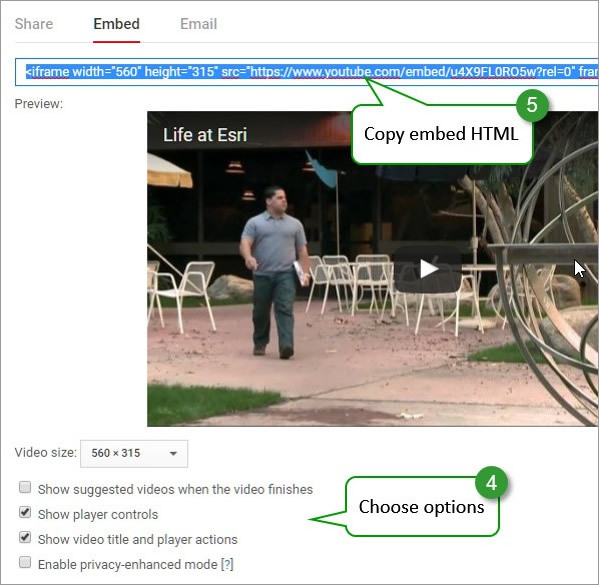 Below are common embed code player options with live examples you can view. Note that all videos were added using Position = Fit as described in step 3 above. Note the use of &. View a story map example using the code above.